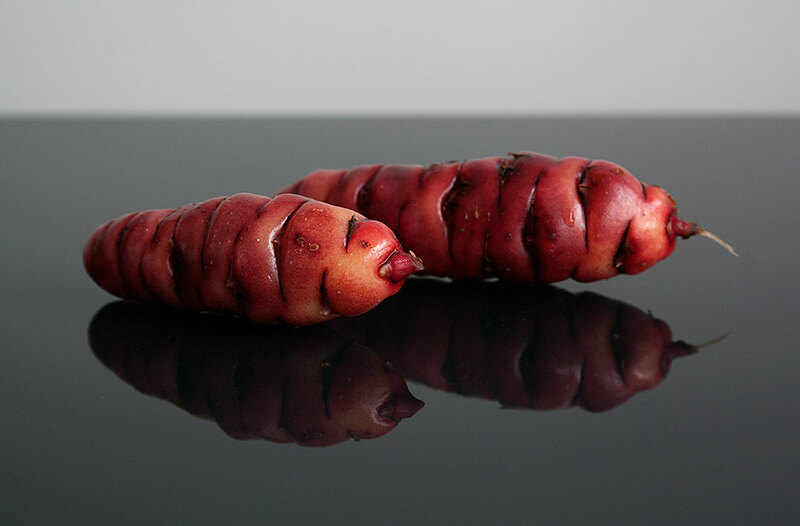 Oca is a tasty little South American Andes plant that has been around in the south pacific for a while. It is the tuberous root of Oxalis tuberosa which is quite large for an Oxalis family plant. The numerous little tubers commonly grow up to about 7cm long and come in a variety of colours, shapes and sizes. They colour of the stems usually reflect the predominant colour of the tubers – red, white, yellow, purple, orange or brown in various mixtures and combinations. They taste like a crispy green dull apple with carrot and lemon overtones when fresh from the ground. They are quite nice eaten like this simply sliced or diced but there is some significant taste variation in the varieties. Keep tasting them and find yourself some good ones. But they taste much better when allowed to dry and mature for a while out of the ground – and in the open air and sun or shade but bright light if possible – and then roasted. The process of maturing them helps convert the starches to a more desirable form and improves the flavour no end when cooked. Do NOT wash them when you take them out of the ground to mature. The presence of the water will for sure make them rot quickly while they are stored. just brush them down like you would a potato. They taste great cooked in traditional Maori fashion slowly underground in a Hangi. (slow cooked steamed fire pit). Oxalis has a huge number of species and many of them have edible leaves (often known as wood sorrel) but this is the only one I am aware of that is primarily grown for it’s root system or tubers. The process of growing them is fairly straightforward and they require little maintenance aside from keeping other weeds away from the them. 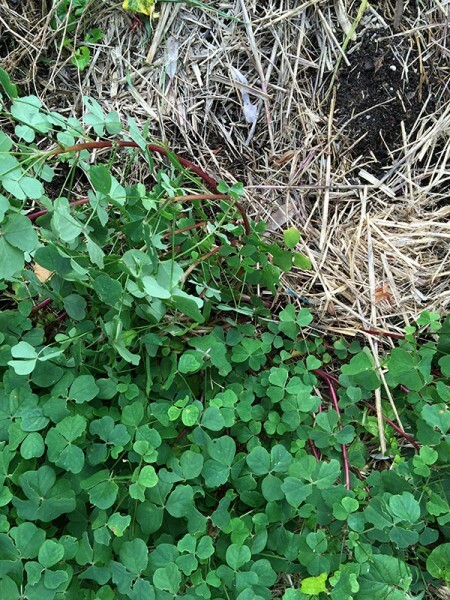 They tend to dominate the space once settled in – which makes for an easy cropping process. They prefer a steady cool climate if possible but they also respond ok to a harsh sunny spot as long as they have a deeply mulched or composted soil to grow in. Like potato and ulluco most of the food production activity is under ground and happens towards the end of the long growing season in Autumn and into winter when the plants die back and start to pump out nice plump tubers much like a potato would. They really are a full seasonal crop that likes to grow from the early spring till late autumn period and will appear to be doing nothing much aside from leaf production for most of that entire time. But the crop is extensive when you get the right soil, sun and moisture conditions. 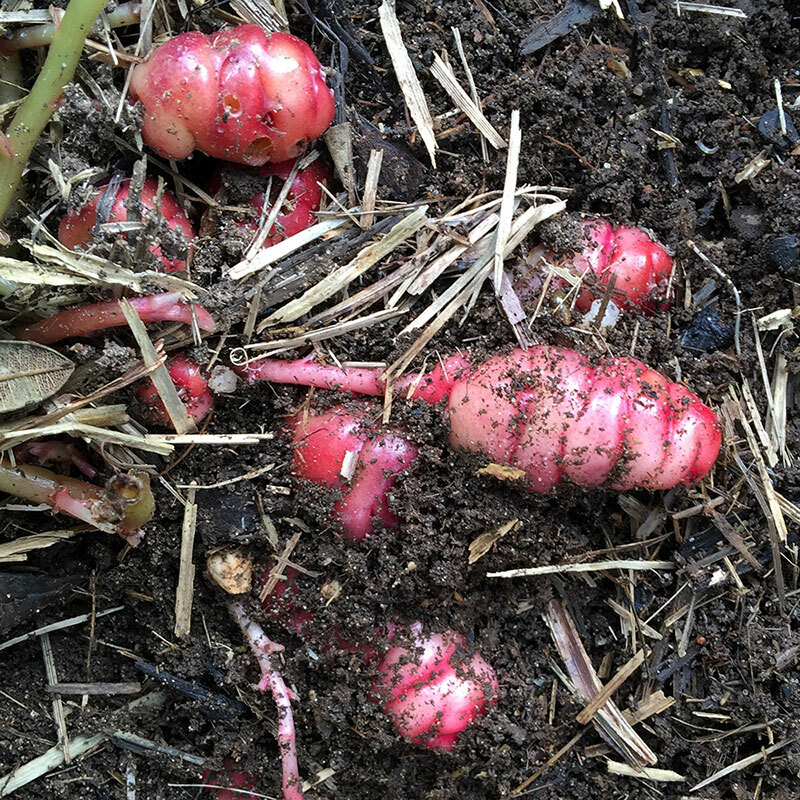 It is easy to see when they are ready – in late autumn scratch some of the root area back and see how big the tuberous lumps are – they will be very near the soil surface and so easy to find. Or you an just wait till the plants start to die back and dg them up then. 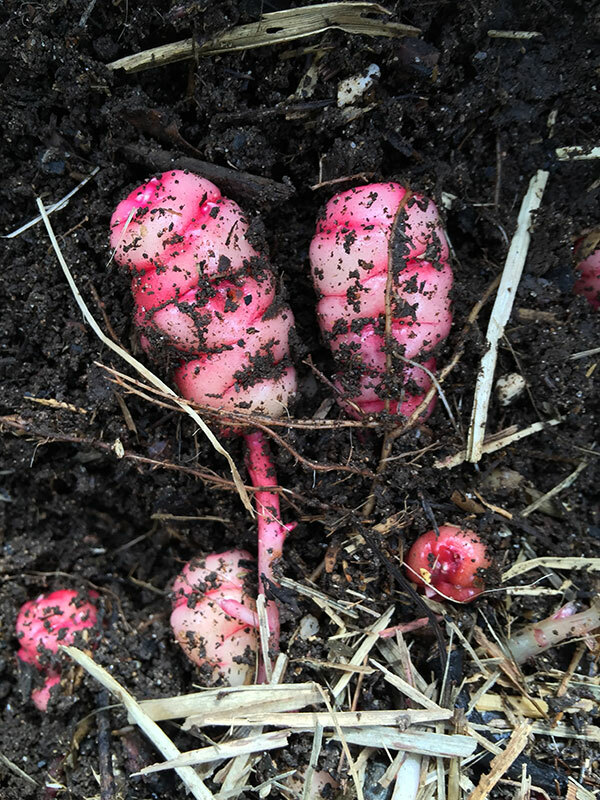 The tuber production usually starts like potato when you see the flowers appear. You can usually leave them in the soil to overwinter and just dig them up as desired. If you have a very cold climate this may not be an option and I guess you would treat them like a potato. They don’t need a lot of additional food – just a good moist deeply mulched soil and some compost. They grow very well in a large pot too. 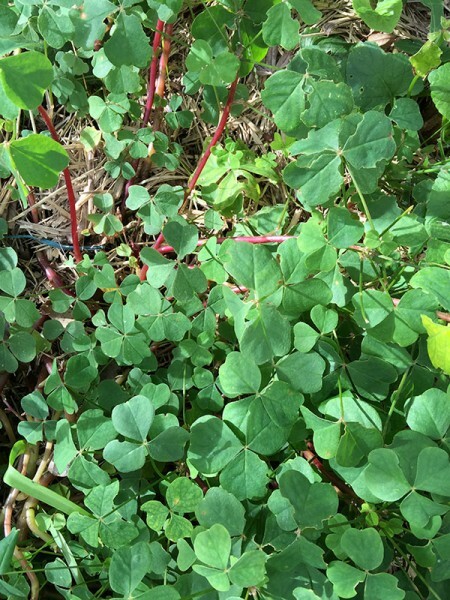 The stems trail out and usually grow to about 80cm at most. 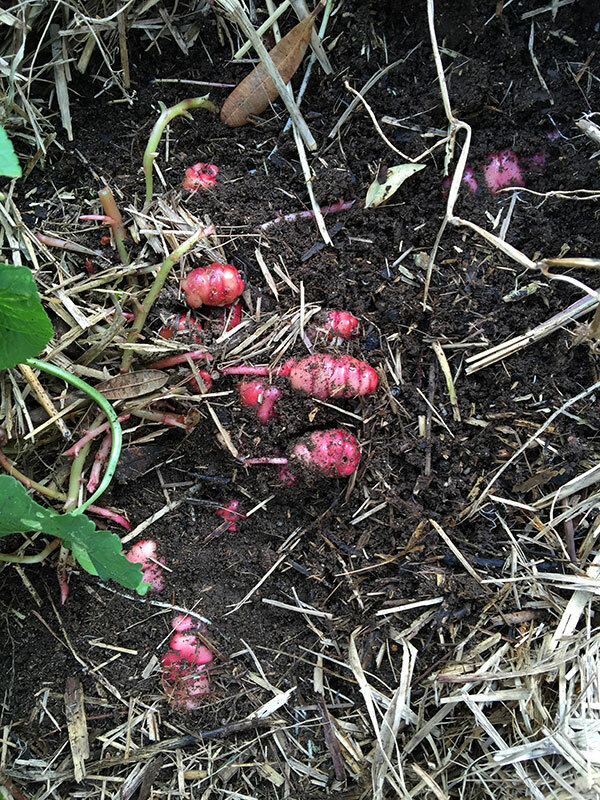 Make sure you leave enough tubers to grow another crop the following year. They produce well so you don’t need a lot of them to start out. In a good year when fully mature they can grow to about 12cm. This is when the weather has been suitable and they have had a nice long moist growing season and a cool winter underground to mature. Best not to pull them up too early and certainly not until the tops have died back completely as this last stage is when the tubers expand and ‘cure’ underground. You can pull the soil back to check on them every few weeks until they have a nice shiny surface skin glow and a good dark and dense colour.